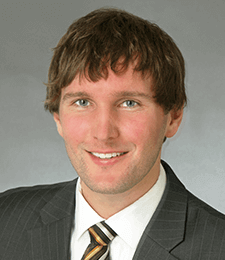 Matt Lavoie defends automotive negligence and other personal injury claims. He assists with insurance and healthcare fraud claims as well as affirmative action litigation related to fraud. Matt also has a focus on declaratory judgment actions; makes, responds to, and argues summary judgment and discovery motions; and handles no-fault arbitration matters. Before joining the Goldberg, Miller & Rubin team in Manhattan, Matt worked in no-fault automobile insurance defense, mostly in appellate litigation, having successfully argued numerous matters before the New York Appellate Division and Appellate Term. Matt’s skill was recognized by the Thomson Reuters search committee when he was selected as a 2018 Rising Star, which is a designation provided to only 2.5% of lawyers who are under forty or who have practiced for less than ten years. Matt earned his Juris Doctor from Hofstra University School of Law and was admitted to the New York State Bar. While in law school, Matt served as a member of the Moot Court Board and as an articles editor for the American College of Trust and Estate Counsel Law Journal. He also served as a judicial intern to the Honorable Denny Chin of the United States Court of Appeals for the Second Circuit.